Located on the west side of town, this is a beautiful location with waterfalls, small lakes, beautiful landscaping, and a very nice room for your reception. 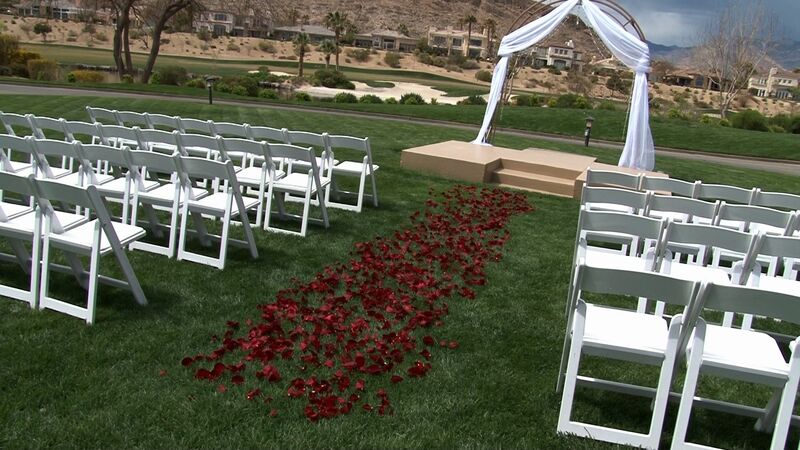 Also on the west side of town in Summerlin, another beautiful location perfect for an outdoor wedding. Across from the ceremony location is a lake with waterfalls and a great view of the mountains. A quaint and well landscaped location for a really nice outdoor wedding. They have three areas in which to choose from where you can have your ceremony. In the past few years they have really upgraded their reception hall, which now makes it one of our favorite reception rooms in which to videotape receptions. It’s a little out of the way from the strip, but if your’e looking for something like this, it’s perfect. A beautiful room for a ceremony and/or reception. This room is decorated from ceiling to floor with floral. A popular location, and rightly so. Located on West Charleston, not too far from the Strip. This is a local hotel located on Boulder Highway. This is a great place for a reception. The large room is private, has a great view of the Las Vegas valley, outdoor patio to really take in the view, and has a luxurious feel to it. 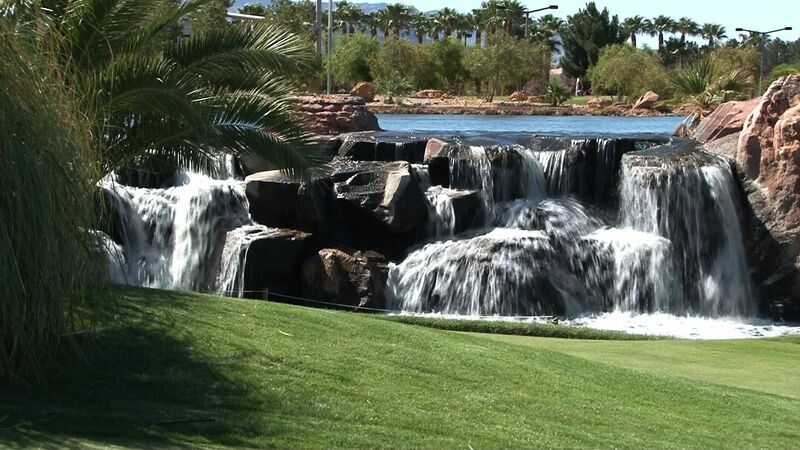 Located in Henderson, this is a great location for photos, especially if you take a short golf cart ride to the lake and waterfall area of the golf course. There is an indoor and outdoor area for ceremonies. We don’t recommend the indoor location, but the outdoor location by the pool is nice with it’s grassy area and large waterfall. Their reception room is large and lovely, and if used at night has a great view of the strip. Having a small wedding? This is another lovely place for a ceremony and reception. 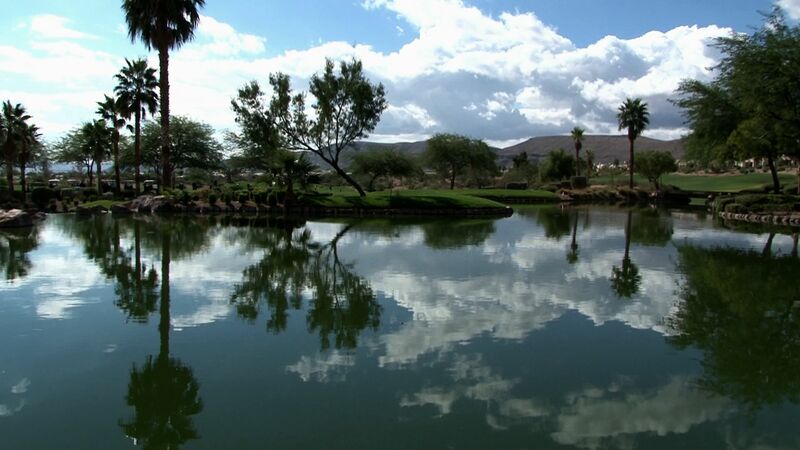 Located in Desert Shores, it has three lakeside locations to choose from to have your ceremony, and nicely decorated rooms, also with a lakeside view, for your reception. Our favorite of the three is Heritage Garden. It’s especially lovely for a nighttime wedding ceremony. 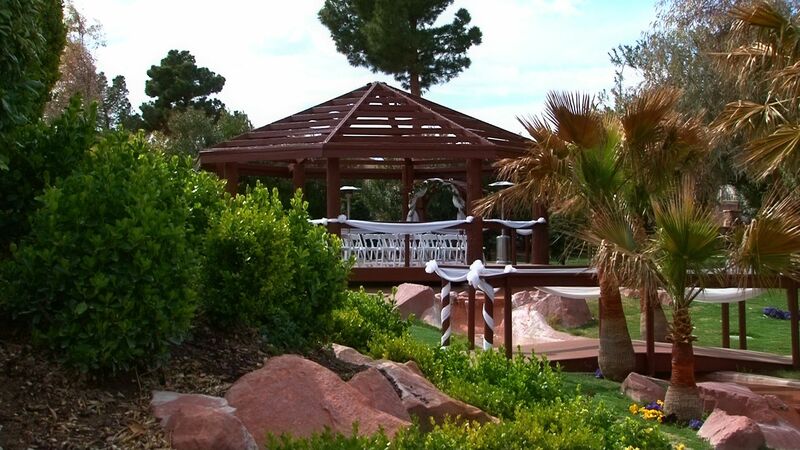 Located in the Summerlin area, this is another lovely area for a medium to small wedding. The reception room is huge with high ceilings, great lighting, and a really nice dressing room with more than enough room for the bride and her bridesmaids to get ready. It also have a large full length multi glass mirror for the bride to make sure everything is perfect for her walk down the aisle. Large grassy area for your outdoor ceremony, beautiful waterfalls behind you as you recite your vows, and a nice sized room for your reception. Also a great location for a sunset wedding. One of the more popular venues. There are many other beautiful locations to get married here in Las Vegas, but these just happen to be a few of our favorites. Let us know your favorite place to get married in Las Vegas. Leave a comment and share your thoughts with other Brides. Congratulations to Lisa & Jacob. In from California, with some guests coming in as far as Taiwan, they had a beautiful wedding ceremony, in spite of the threat of rain all day, at Angel Park Golf Club. 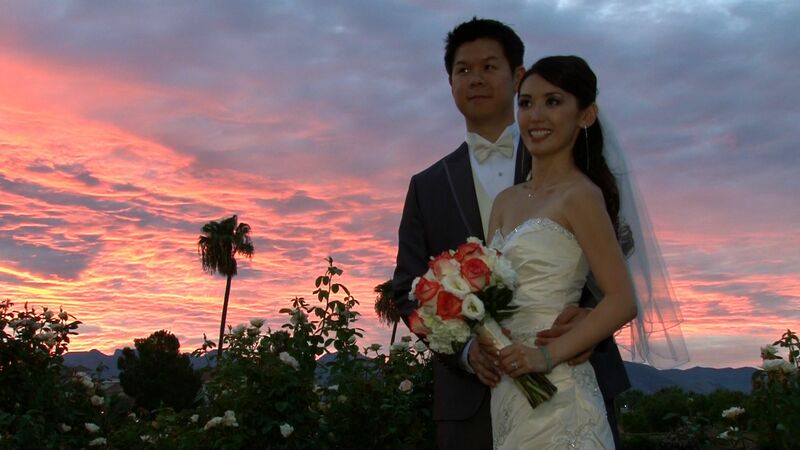 Because of the weather, they were presented with a double rainbow, and a beautiful sunset. Their day was topped off by the release of 20 or so Chinese Lanterns. We wish the both of them years of happiness. Recently there has been news about a couple of Wedding Photography and Videography companies that have turned out to be scams. The odds are that there are more throughout the country. So how do you choose a reputable Wedding Photography and Videography business and protect yourself? The following recommendations are based on personal observations, working with numerous wedding photographers over the years, and our own personal opinion. 1) Always Go Local. The companies mentioned before were not local businesses. One was a nationwide company, and the other one covered four states. Know who you are dealing with. Check out their website, reviews, and Google the business and owners name. With a local vendor, you can meet with them, making sure they are a good fit, and you can be sure they are who they say they are. Destination Bride? If you come to town before your wedding, ask to meet with them. One commonality among these two businesses was that they offered unlimited hours and no travel fees. Sound too good to be true? If you research most reputable wedding photography and videography businesses, they rarely offer unlimited hours, and usually charge some kind of travel fee depending on the distance. These days there are a lot of people who buy a camera, label themselves a wedding photographer or videographer, and then decide to hang up a shingle. Make sure you are dealing with a professional. If they are an amateur, make sure you are aware of that ahead of time and make your decision to hire them based on that. 2) See The Work. The problem with national companies, is that you have no idea who will show up to photograph/videotape your wedding. The wedding photos and videos shown on their website are almost useless. Who was responsible for those photos/videos? Do they even work for the company anymore? Do they even work in your state? They contract out your wedding, usually to a freelancer, so you never know who will show up to your wedding. You hire a wedding photographer or videographer because you like the photographs and/or video demos you’ve seen on their website and blogs. It’s only right that you get that person who is responsible for the work. If there are more than one photographer or videographer on staff, ask to see the work of the person they plan to send out to your wedding. We worked one wedding where the photographer sent out her daughter, who hadn’t photographed a wedding in over a year, never shot a wedding in a church, (this was a catholic wedding), and showed up in a college sweat jacket. The couple hired the photographer because they liked her style,artistry and the photographer herself, they didn’t hire her daughter. In our opinion, that was so wrong on many different levels. 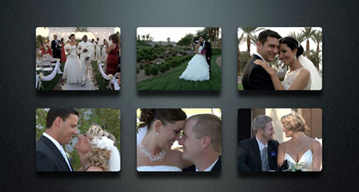 Each photographer and videographer has their own style and ideas. Make sure you get who and what you are paying for. 3) Make Sure You Have a Contract. Usually the retainer/deposit is non-refundable. To protect yourself, make sure there is something in the contract that states if they are unable to complete the contract, (a no show), they are liable for returning the retainer/deposit. With the above mentioned scams, the contract only stated that the retainer/deposit was non-refundable, nothing about a no show liability. Unfortunately, most of these couples will probably never get their retainer/deposit back, even though no one showed up to their wedding. Many other couples have not received any photos or videos, and probably never will, even when someone did show up to their wedding. We recommend Googling articles concerning this subject. There is a lot more information and ideas on how to book a reputable photographer or videographer. We’ve listed the three we think are the most important, especially with the recent scams that were perpetrated on so many couples. Any ideas you would like to share, please leave a comment.